This stamped concrete walkway is beautifully offset with a cream colored border. 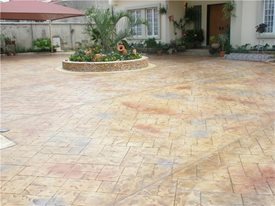 Akinyemi operates Artscapes Limited, a company based in Lagos, Nigeria, that specializes in creating beautiful stamped and colored outdoor surfaces for residential and commercial clients. He works diligently at marketing his products and services, evidenced by a fully featured website and an inspiring calendar. This combination of quality work and focused marketing is what has made Artscapes successful, and will continue to make them successful in the future. Stamped and colored concrete was used to liven up this small patio. 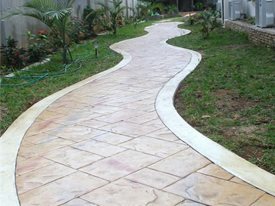 According to Akinyemi, the decorative concrete industry in Nigeria is growing. "It first started with terrazzo for interior floors and colored interlocking pavers for outdoor surfaces. Stamping, staining, and overlays were introduced about ten years ago. We came into the picture in 2003, when we stamped our first patio. Over the last seven years, we've worked hard to promote stamped concrete amongst specifiers and home owners alike," Akinyemi says. He predicts that there will continue to be growth in the Nigerian decorative concrete industry and is excited to see it become more robust on the demand and supply sides. Nigeria is considered to be an emerging market, with their economy growing rapidly in recent years. The increase in prosperity has created the perfect market for decorative concrete. People are looking to upgrade the exterior of their homes with something luxurious, but durable. Decorative concrete fits the bill perfectly. Artscapes has taken advantage of this increase in demand for their product by getting their name and product out there through different marketing avenues. This colored concrete creation from Artscapes serves as a basketball, tennis, and volleyball court. Artscapes does exterior work that provides an elegant atmosphere to any home or business. 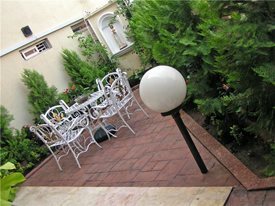 They have stamped many driveways, patios, and pool decks throughout Nigeria. 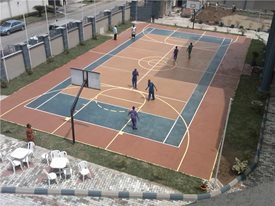 However, they recently branched out and created a unique and colorful multipurpose basketball/tennis/volleyball court. Akinyemi's favorite project to date is a private residence at Parkview Estate Ikoyi. The client - a building contractor - was building a live-in show home. Artscapes collaborated closely with the client's wife and a garden specialist on the project. The results turned out great, providing the building contractor with a product he will be truly proud to show off. This driveway was stamped with an Ashlar Slate pattern, giving it the look of natural stone. For this project, Artscapes used a variety of stamping mats to achieve the look of real stone. An Ashlar Cut Slate pattern was used to stamp the driveway and walkway. Both a Rossette and European Fan pattern were used to stamp the porch. The driveway and walkway also feature seamless texture borders. The main colors used were longe brown and cream for the border, both colors were custom created by Artscapes. Accent colors included terra cotta, platinum and brown, created using antique release powders from Creative Impressions UK. It is exciting to see companies, like Artscapes of Nigeria, promoting decorative concrete around the world. We believe that this is only the beginning for Akinyemi and other passionate international decorative concrete contractors just like him.